When I was a kid, my dad called them “flying stoagies”, something he picked up from an old ornithology professor. I always thought it was funny even before I really got what a stoagie was, because there’s something inherently joyful about the chittering, chattering Chimney Swifts that circle just about every neighborhood in eastern North America. Here in the southeast, we get to watch as the flocks of sickle-winged midge tyrants funnel back south again every fall, pausing to congregate most evenings in the old smokestacks that tower above the empty tobacco factories in downtown Durham, North Carolina. Hundreds of birds, even thousands at their peak, spiraling down into the meter wide opening like so much bathwater down a drain. And the next day they’re gone, coursing over the skies of South America. The entire population hidden in the deepest parts of Amazonia. In fact, how we came to know this about the familiar Chimney Swift is one of the coolest stories in all of ornithological history. In 1934, in an attempt to discover just to where these birds were disappearing, the ornithologist John Calhoun and others banded 550,000 swifts as they roosted in chimneys in the upper south. It was the largest all-volunteer effort to study a migratory bird ever undertaken. For years they continued banding swifts, discovering practically nothing of the half a million birds ringed and released, until 13 swift bands were recovered by a group of American Indians who had turned them into a missionary in Amazonian Peru. Apparently the Indians had been smoking out a massive dead tree in the rainforest to harvest the birds roosting inside, a practice centuries old, only to find, this time, tiny metal bands on their legs. Birds that had been banded in Nashville, Tennessee. And thus, the wintering grounds of the Chimney Swift were discovered. It’s an exotic story for such a familiar bird. One I considered as I watched a large flock of Chimney Swifts appear above me while I was birding, ostensibly for fall warblers, this past weekend. The birds were hawking winged insects popping off the tops of the nearby oak trees, coming as close as 30 feet of the ground. The conditions were perfect. I raised my camera. Chimney Swifts are easy enough to see, but photographing them requires very specific conditions and a certain acknowledgement of frustration from the start. You have to know that you’re going to get a lot of photos of the sky. 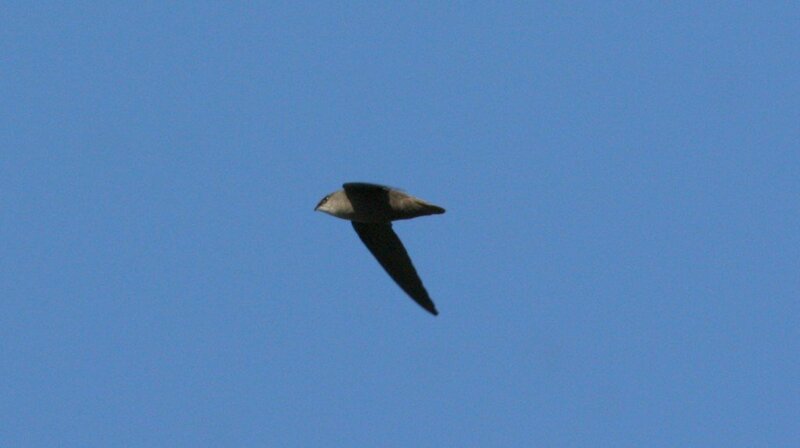 But the light was great, just barely peeking over the treetops behind me and crucially, there was a stiff breeze out of the west so that the swifts, upon turning their loops into the wind, would hang up a little and coast for a couple hundred meters before banking and speeding off. This split-second pause in their otherwise frantic foraging allowed me to find them in my viewfinder and let the autofocus do its thing. 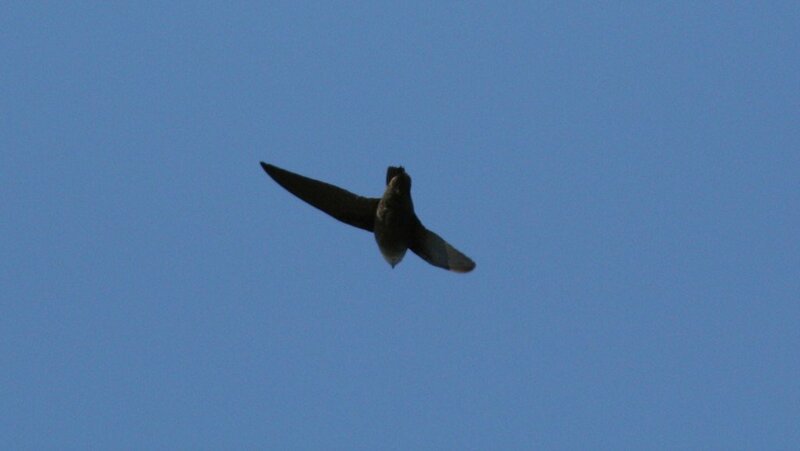 The full sun let me crank up the shutter speed, and I managed to freeze a few of the swifts as they passed overhead. Such a bizarre bird with massive eyes and tiny bill. There’s something almost alien in that face, the look of a bird you far too often see as a silhouetted shape far above you chattering as they pass by. The birds foraged for a while, circling higher and higher, before heading out beyond my ability to find them. 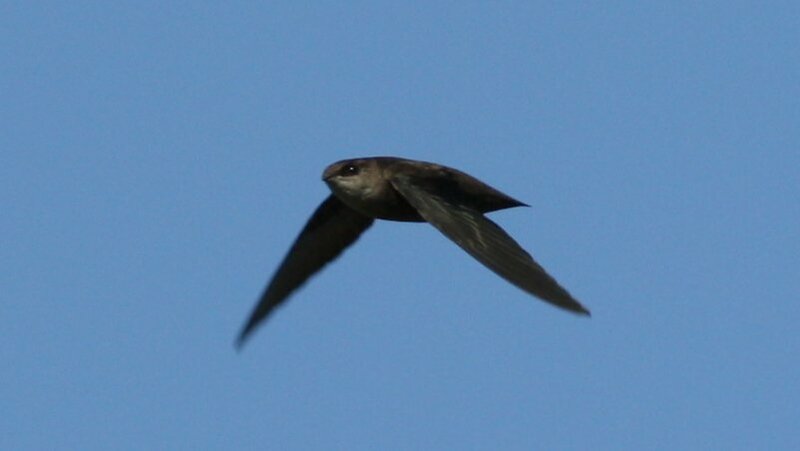 We’re well into October, so these may well be the last significant group of swifts I’ll see this year. 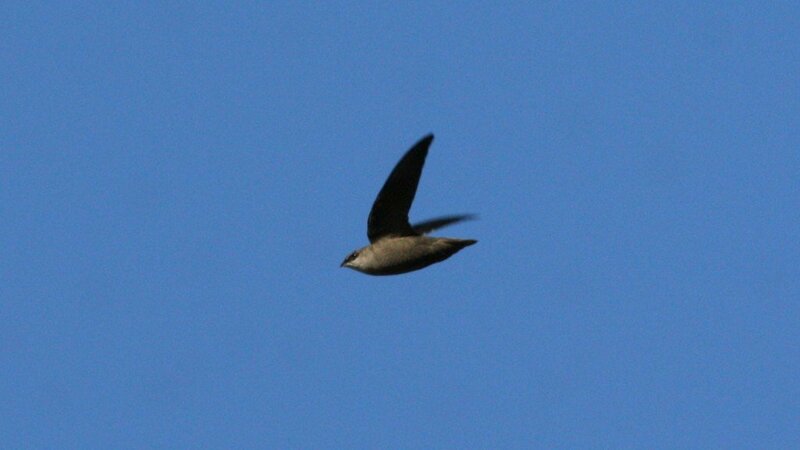 I always look forward to their return in the Spring, but swifts, like too many species of birds, aren’t doing so well. This is doubly concerning because this is a species that, for over 200 years, has tied its fate to our own. Since the first Chimney Swift was recorded nesting in a settler’s cabin in Maine in 1682, they’ve depended on us to provide nesting and roosting sites across much of their range. But fewer houses have fireplaces anymore, and those that do often cap them, as swift nests left unattended in a chimney can be a fire hazard. So encourage your fireplaced neighbors to leave their chimneys uncapped for the summer to attract swifts. They’re mostly unobtrusive houseguests and so long as you clean your flue before the weather gets cold, you’ll be fine. Some organizations have even built nesting and roosting towers, artificial chimneys that serve as a site for the swifts in lieu of residential dwellings. My own Audubon chapter, Wake Audubon, is currently working with the state museum to raise money to fund the construction of 30 foot tall tower at a local park, complete with cameras inside the tower to feed video to excited swift enthusiasts. To learn more, check out this brochure (.pdf). So these flying stoagies can continue to brighten our summer, and fall, days. Nice job! You even got some catch-light in the eyes. Great post and photos Nate!